On 11th December 2007 Sotheby's in New York sold a Society of the Cincinnati medal which had belonged to Washington and later to Lafayette for 5 millions dollars ($5,305,000 - I counted the noughts carefully!). The numismatist Greg Reynolds declared himself "flabbergasted" at the anticipated sale price - an American medal or "order" had never before made as much as $500 000 at auction. The Society of the Cincinnati was created in April 1783 by American officers who had fought in the War of Independence; in May an invitation was extended to French officers who had participated; the French ordre de Cincinnatus had Louis XVI among its members. By early 1785 there were two thousand members. (As a hereditary order, in 2005 it still had "some 3,700 members", descendants of commissioned officers of the Continental Army or Navy and their French counterparts who had served in the Revolutionary War. ),Washington was president of the Society until his death in 1799. The original medal or "order" was designed by the Continental Army officer Pierre Charles L'Enfant, the future architect of Washington DC,at the invitation of his former commander von Steuben. 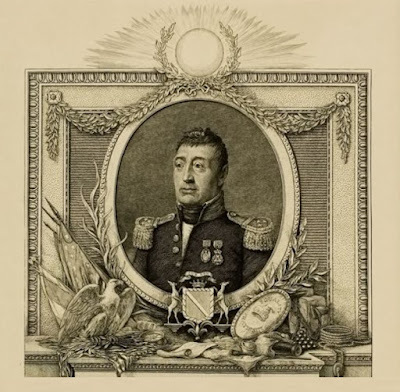 His design was based on a simplified version of the description given in the "Institution" of the Society which had been drawn up by General Henry Knox, chief artillery officer of the Continental Army and later Washington's Secretary of War. The medal features a golden eagle surrounded by a wreath. An enamel medallion on the eagle's chest shows two senators presenting a sword to Cincinnatus who stands beside his plough. The Latin motto proclaims that the owner "left everything" to serve the Republic. ("Omnia Reliquit Servare Rempublicam"). Washington specified instructed that the medals, which were to be paid for personally, must be "finished in a masterly manner (and) ornamented in an elegant, tho' not costly Stile". L'Enfant spent five months in France working with the jewellers Duval and Francastel and with the engraver Jean-Jacques André Le Veau who produced the copperplate for an accompanying diploma. Although the earliest examples were all made by Duval and Francastel, there are numerous variants on the basic design, including at least six from the 1780s. A larger silver medal, intended as a keepsake rather than as a decoration to be worn, was designed by L'Enfant but not cast until the 20th century. . 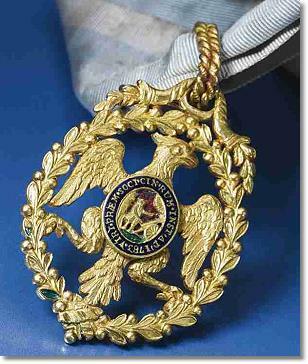 In 1784 French naval officers commissioned for Washington the Diamond Eagle, now in the collection of the Society, which became the president's insignia of office. 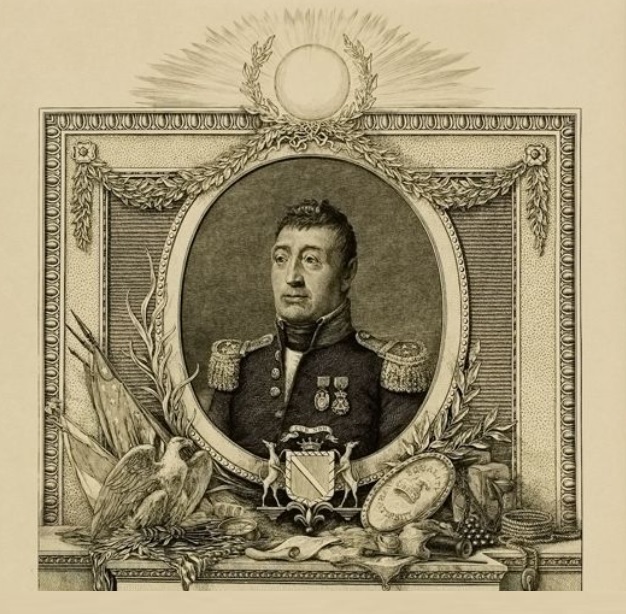 Washington also possessed several gold badges - the one depicted in a portrait in the New York Historical Society is clearly a different example. The medal which was auctioned is believed to have been specially made for Washington by Duval and Francastel in 1784 at a cost three times the price of any other medals that were available to American and French officers. As Mr Reynold sagely concludes, the inflated price fetched by the medal reflects mainly its symbolic value as "a treasured possession of Washington" embodying the personal bond between Lafayette and Washington and, with it, the alliance of the United States and France. Even so, the thing is tiny. It measures only 1.5 by 1.125 inches. The consignor was Lafayette's great-great-granddaughter, the Baroness Meunier du Houssoy. Her son and heir Arnaud, who was in America for Lafayette's 250th birthday celebrations in 2007, is a successful investment banker. After a "spirited 11-minute auction" involving three bidders, the medal was bought by the Fondation Josée et René de Chambrun which owns the Lafayette family château of La Grange, thirty miles east of Paris. There was a certain amount of opportunism about timing of the sale since in 2007 the Fondation had received a payout of $70 million for its shares in the Baccarat crystal glass firm. According to Christophe Van de Weghe, the Manhattan gallery owner who bid on behalf of the Foundation, the medal is a symbol of French-American friendship, and there are only two places where it should reside - La Grange or Mount Vernon. 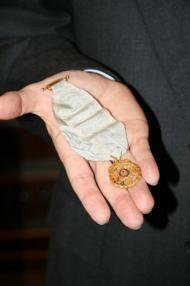 Sadly La Grange is not open to general public, but there were promises that the medal would be exhibited in America soon. "Le bon David" meets 15 atheists.